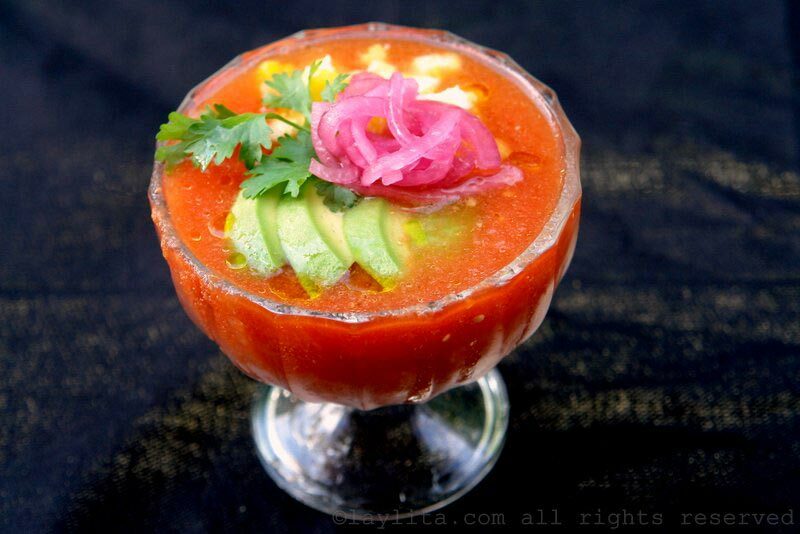 Gazpacho is a traditional Spanish chilled soup made with tomatoes and peppers. It is a very popular summer dish. Anyone who’s been to Spain on a hot summer day can easily relate to how refreshing it is to eat a bowl of this chilled tomato gazpacho. 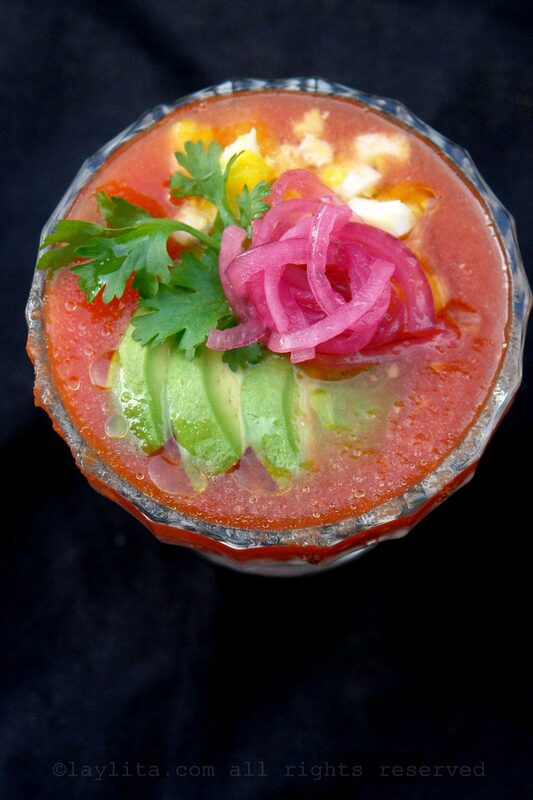 One of the things that I love about gazpacho is all the different topping options. 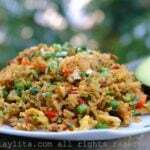 The traditional toppings usually consist of diced bell peppers, diced boiled eggs, and diced cucumber. Personally, I love to include avocado as a topping, diced or sliced. For a more modern touch, I also tried serving it with an avocado cucumber sorbet. 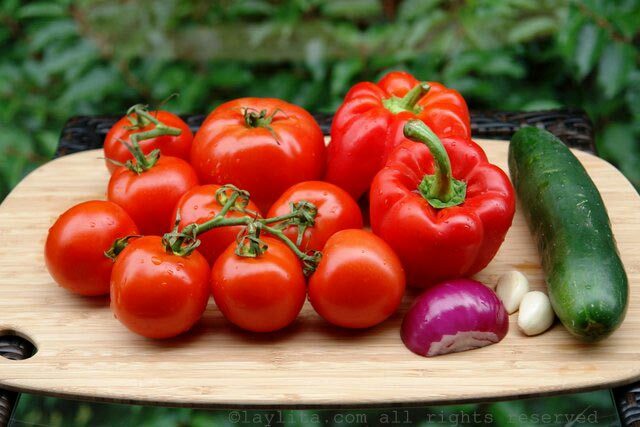 I also like to make a quick salad or salsa with bell peppers, cucumber, onions and cilantro with lime, and use it as a topping in place of the plain diced veggies. 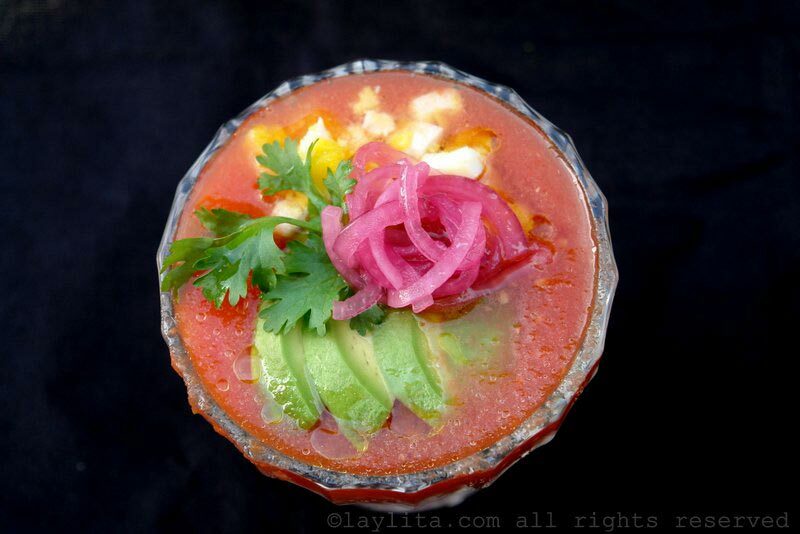 Easy recipe for Spanish tomato gazpacho, a refreshing chilled soup made with ripe tomatoes, bell peppers, cucumber, and more. Served with garlic bread, and topped with diced vegetables, hardboiled egg, pickled onions, avocado sorbet, etc. Peel the tomatoes. An easy way to do this is to bring water to boil, make a cross or x cut on each tomato, place them in the boiling water for a couple of minutes until they start to peel. 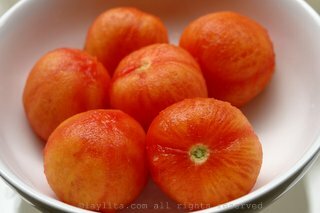 Remove the tomatoes from the hot water, run them under cold water, and remove the skin. 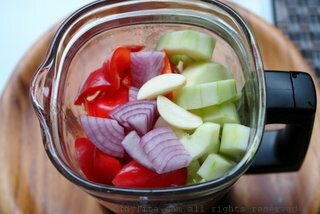 Place the tomatoes, bell peppers, cucumber, onion, garlic, and salt in a blender or food processor. Pulse and blend until you obtain the consistency you want for the gazpacho, it can be either very smooth or more on the chunky side. 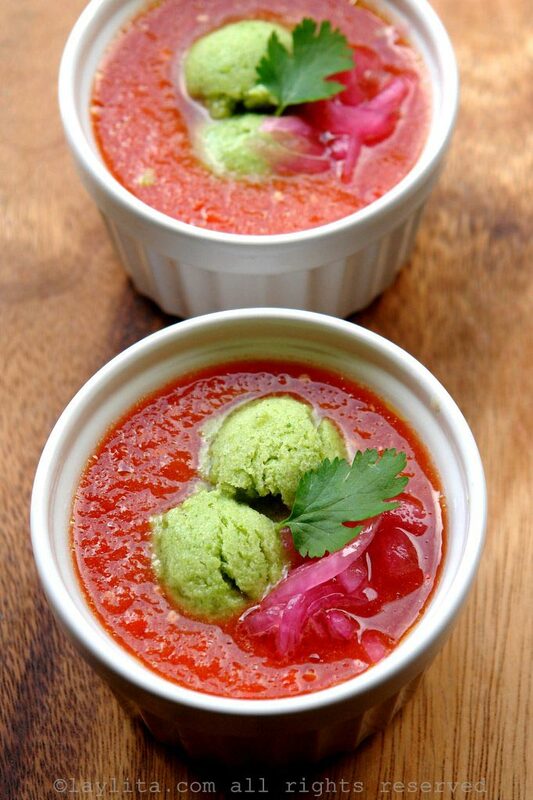 Pour the gazpacho mix into a large bowl, cover, and refrigerate for at a few hours before serving. Stir in the sherry vinegar and olive oil right before serving, and serve with your choice of garnishes. 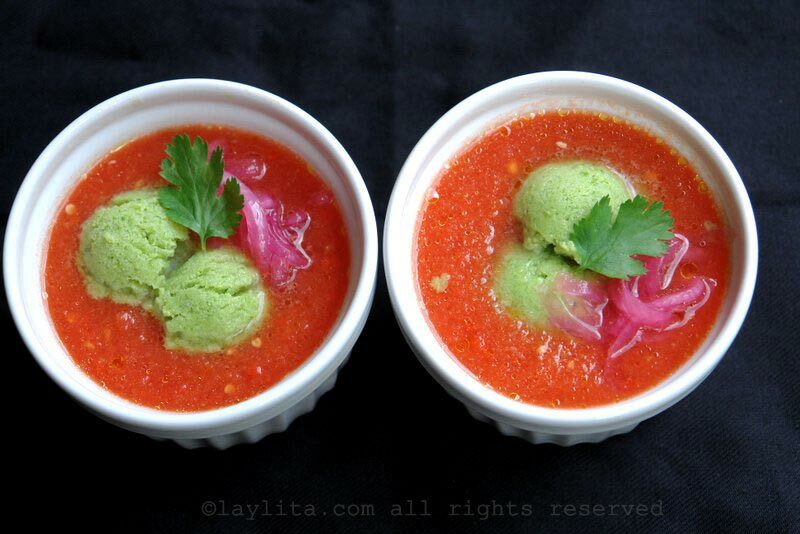 I also find that cebollas encurtidas or lime pickled onions make a delicious garnish for this chilled tomato soup. 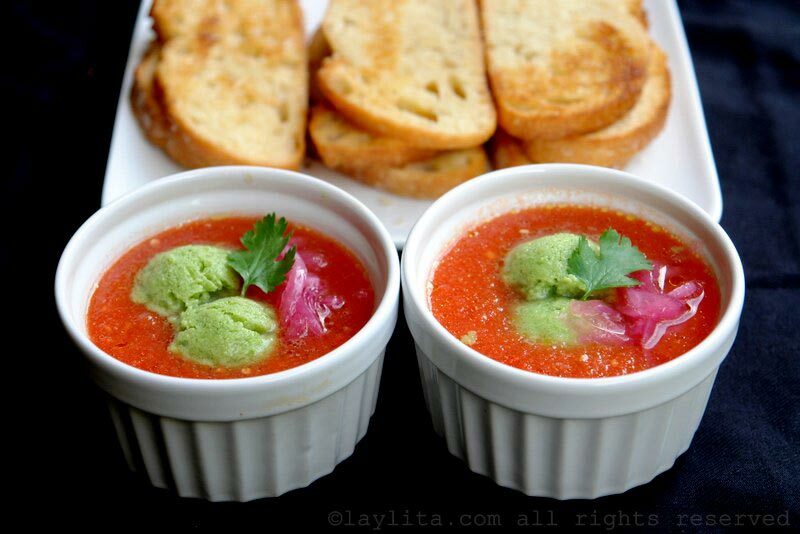 Gazpacho is also served with garlic rubbed bread slices on the side. 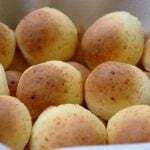 The bread slices are fried or toasted in a pan with butter and then you take a whole clove of garlic and rub it on the bread. 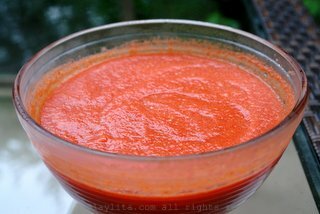 I found some Spanish red peppers, which look like longer versions of the typical red bell pepper, and I loved the way they tasted in the gazpacho. 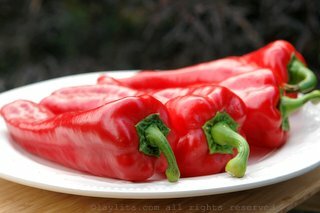 However, they aren’t always available, so most often I end up using regular bell peppers. 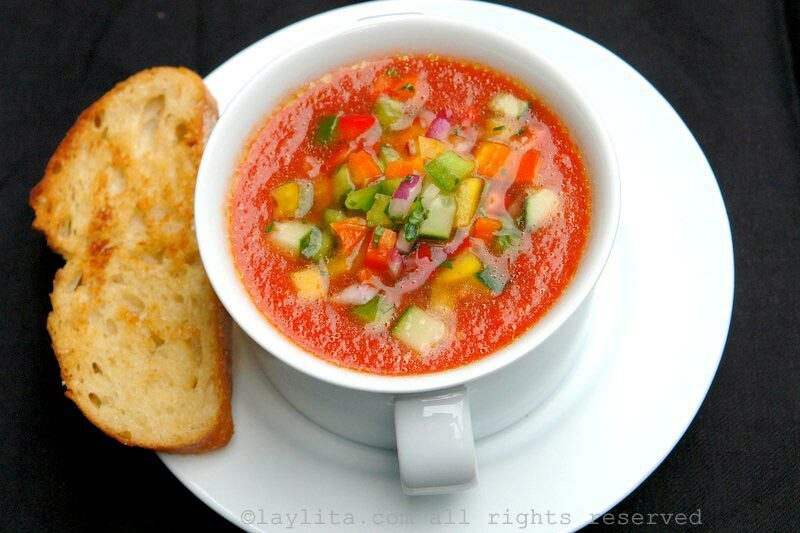 Most regions in Spain do not add bread to the actual gazpacho soup. Cadiz is one of the exceptions, but for the most part if you add bread you are making a variation called salmorejo. 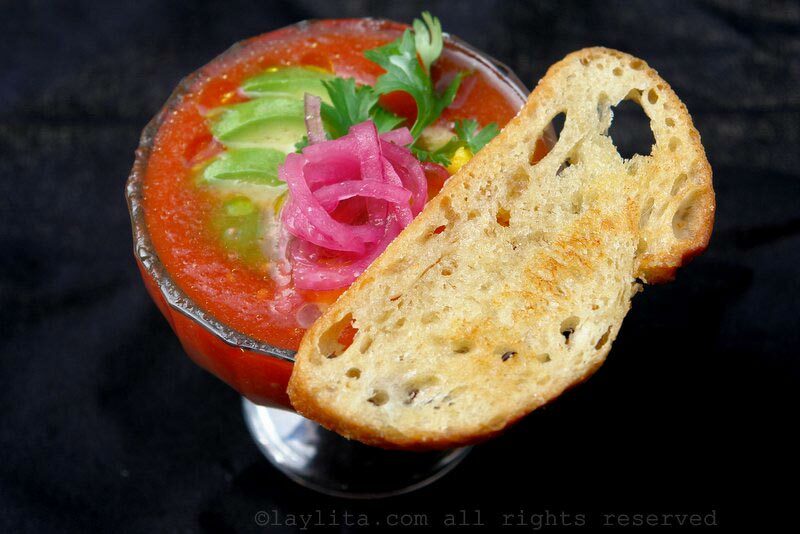 For a more traditional Spanish gazpacho serve the bread on the side instead. 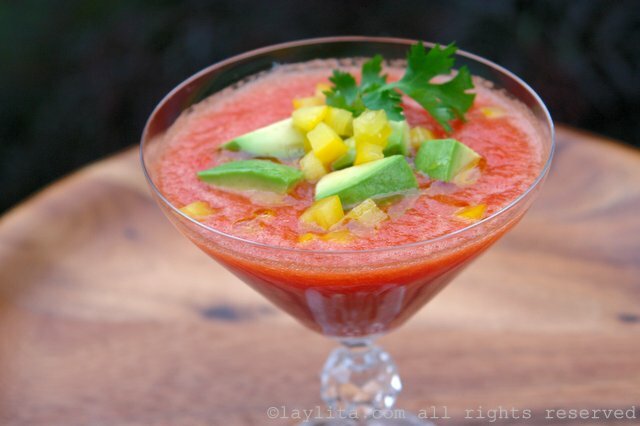 Gazpacho is a great make ahead dish for a family dinner on the patio or a summer party with friends. 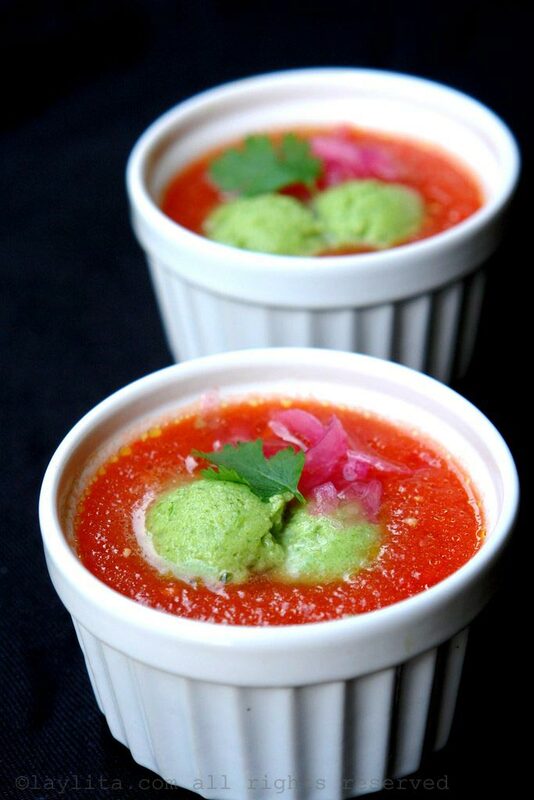 You can make the gazpacho the night before and keep it in the fridge until ready to serve. The toppings that you choose, including the fried garlic bread, can also be prepared in advance. 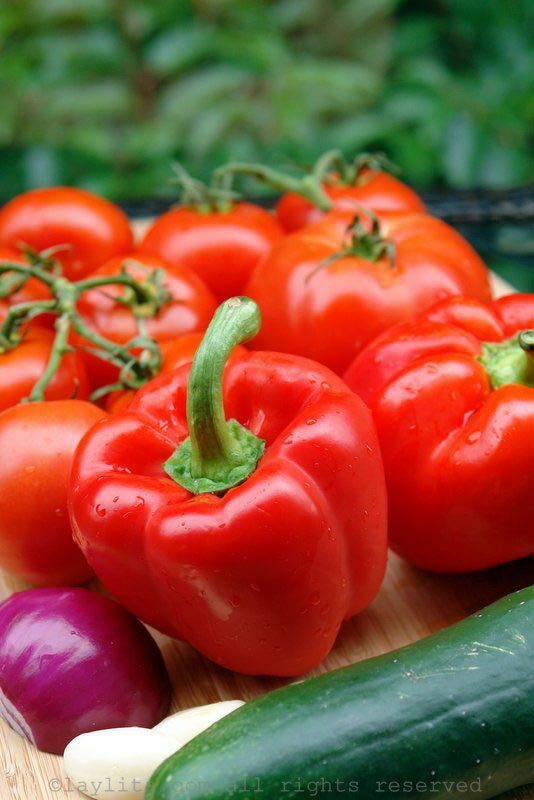 – Use ripe fresh tomatoes and please avoid using canned tomatoes (I cringe when I see that happen). 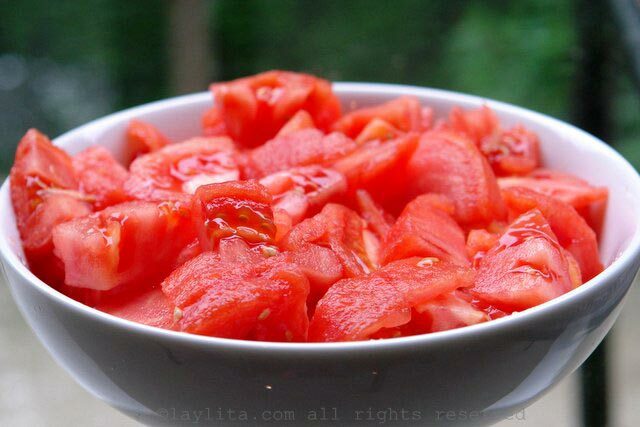 – The tomatoes should be peeled, some people remove the seeds, but I find it optional and it’s a personal preference. 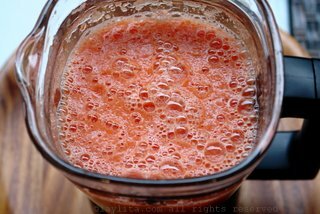 – Gazpacho tastes better when it has been chilled for a decent amount of time. I would say give it at least a couple of hours, but overnight is ideal. – Olive oil and vinegar (or lemon juice) should be added right before serving. 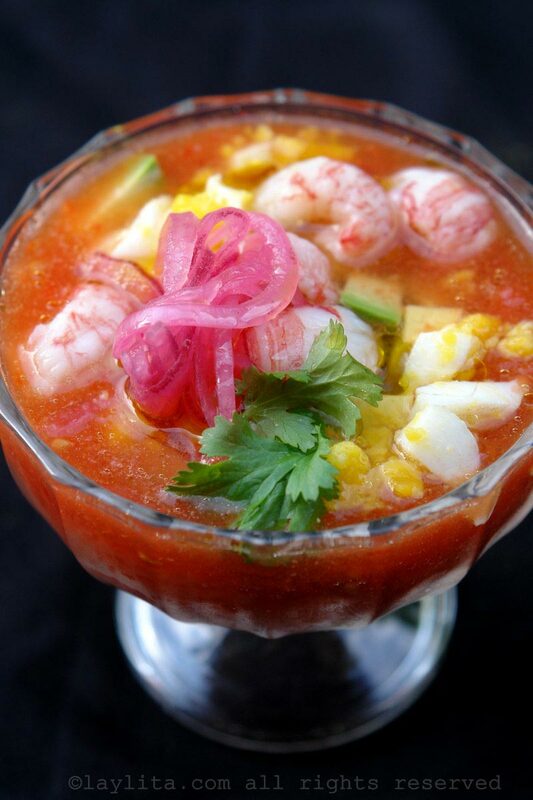 – Be creative with the toppings or garnishes for the gazpacho, you can let each person add their choice of toppings.